"High Chaparral" is a yacht that was launched by the Dutch yard Feadship some time ago, but we want to present it to our readers because of its special features, some of which - such as the great height of the structure on the waterline - are part of the typical Feadship style. 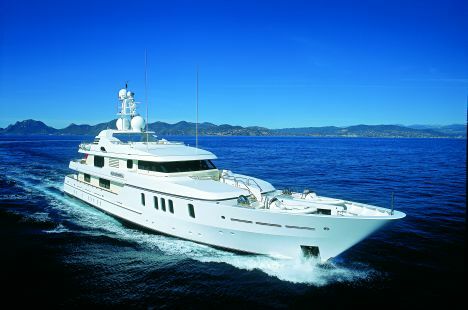 For further information contact Feadship Holland B.V.; Zijweg 148c; P.O. Box 5238; 200 GE Haarlem; The Netherlands; Tel. 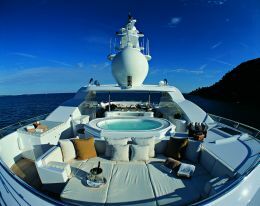 +31 (0) 23 5247000; fax +31 (0) 23 52470000; website www.feadship.nl; e mail info@feadship.nl. But precisely this basic characteristic of these prestigious Feadship yachts did not fit in with the owner's requirements: he wanted a yacht that was low profile yet with highly liveable interiors. This meant a complex job for designer De Voogt, who succeeded in combining all the elements necessary for the creation of an alluringly designed superyacht in line with its owner's expectations. To achieve these objectives he used the most sophisticated design systems which supplied valid aid in creating environments both welcoming and, especially, equipped with those attributes of vibration and noise absorption beloved of De Vries. This to such a degree that the yard considers "High Chaparral" one of the most silent yachts ever built. But again with view to comfort both under way and at moorings, systems have been installed on this model such as KoopNautic zero-speed, which gives maximum stability even at anchor. The owner gave the designers numerous basic elements on which to base the design, including several aesthetic and functional details usually proposed by the yard or the designers, such as for example the location of the tenders which are stowed forward on the main deck. The crew can thus handle launching and recovery of auxiliary means without in the least disturbing the life of guests on board. This choice points to the owner's intention of also chartering "High Chaparral", as do the interiors and the spaces dedicated to conviviality. Again from the design viewpoint, one of the features that stands out at first sight is the development of the superstructure forward, running the whole width of the beam, which produced spacious environments and fully exploited the corresponding area of the lower deck for stowage of materials and for stores. Notwithstanding these features, the profile of "High Chaparral" is soaring, thanks to curved and flowing lines which, interlinked with special care regarding the perceived volumes, give this yacht a profile in line with the expectations of its demanding owner. In the combination of steel hull and aluminium superstructure, marine architect De Voogt identified the ideal combination for this yacht, built in accordance with what is prescribed by Lloyd's +100A1 SSC, Yacht, Mono, G6, LMC, UMS and MCA. 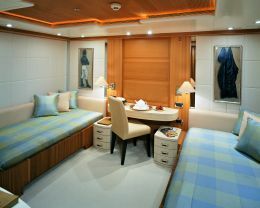 The interiors were designed and developed by Terence Disdale who envisaged a total of five cabins for the owner and his guests, plus those forward on the lower deck for the crew. 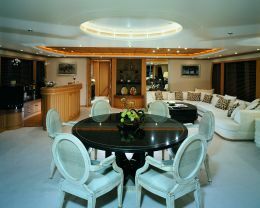 The owner's cabin is the only one situated on the main deck, forward of the amidships area. It is very spacious, housing two complete and independent bathrooms, an office, a relaxation area with sofas and table, a dressing table zone, and a cabin with wardrobes and dressing room. 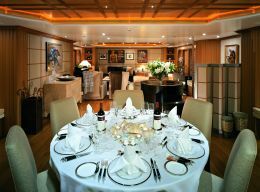 For the guests there are four cabins on the lower deck, two of them slightly aft of the amidships area, with double bed, private bathroom, dressing table area and plenty of cupboard space, and the other two in the stern with twin beds, private bathroom and, like all the other cabins, latest generation entertainment systems. 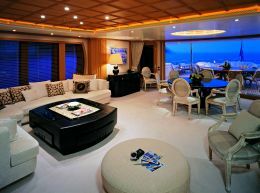 Going back to the main deck we find spacious areas for relaxation an conviviality. Here too there are entertainment systems and furniture which, refined in both design and ergonomics, ensure a high level of comfort. 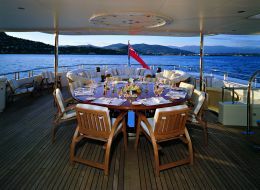 The aft area of this deck is open and partially sheltered by the extension of the deck above. There is a large size sofa set athwartship with coffee tables and armchairs, plus a round table with four small armchairs in the sheltered area. The upper deck includes the bridge, which extends over the entire beam of the superstructure in the forward area. 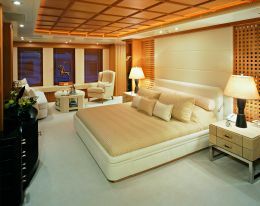 Nearby is the captain's cabin with double bed and private bathroom, as well as direct access to the bridge and the adjacent office. 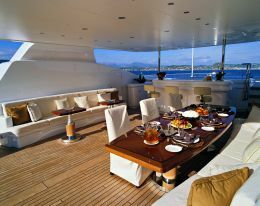 The central area of this deck contains another relaxation area, a corner with an L-shaped sofa, a bar and a dining table seating six. The whole is situated in a favourable position for enjoyment of the panorama offered by the large windows in the superstructure. 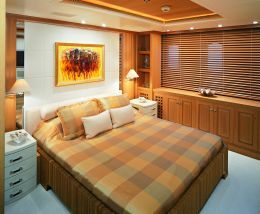 The interiors of this yacht, as expressly requested by the owner, are all in refined materials combined to offer very high levels of comfort also in the areas not set aside for guests, such as the crew and technical zones. The interior as much as the exterior can assure 20 people maximum comfort on a long cruise. Division of the spaces leaves everyone the right degree of privacy, as it should be on a cruise vessel with a range of no less than 4.500 miles at a cruising speed of 12.5 knots. Aboard "High Chaparral" there are numerous systems dedicated to relaxation, but electronics is chiefly there to ensure high safety levels through control of the propulsive systems and the on-board plant. Integrated systems, then, from which information may be obtained regarding the state of each individual mechanical or electrical component: video-cameras for internal and external checks, sensors that set off alarms in the case of anomalies or the detection of smoke. As mentioned previously, the presence of electronics and systems for guaranteeing maximum comfort for guests also includes KoopNautic stabilisers, which do not need hull inertia in order to operate but which, even with the vessel stopped, are capable of compensating for movement along the longitudinal and transversal axes. The tenders - two 6.2 metre RIBs with four stroke 115 HP outboards - guarantee suitable levels of comfort for guests' excursions, but that's not all: the internal garage also contains two Yamaha jet-skis, windsurfing boards, SCUBA gear, water-skis and wakeboards, as well as other inflatable craft that can be towed by the tenders and assure water-sport lovers plenty of fun.